We offer K-laser therapy which uses the energy of light to minimize inflammation. 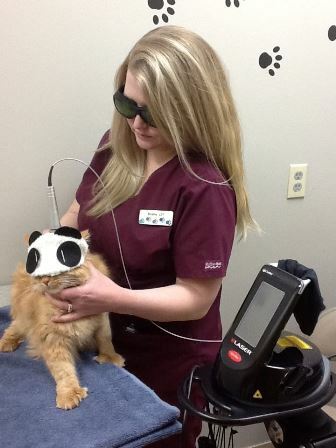 There are numerous situations in which laser therapy could be very effective for our patients including: post-operative management of surgical incisions, post-dental care, acute orthopedic diseases, soft tissue trauma, urinary bladder inflammation, and skin or ear inflammation and more. Generally at least 3 episodes of laser are necessary for most acute and chronic pathologies. We have also had success with periodic 'touch-up' appointments after the initial treatment series resolves inflammation. ​The procedure is handled in the exam room with a device that appears similar to a flashlight. Everyone wears protective eye goggles (or 'doggles'!) during the 2-4 minute laser experience. Our clients and pets have given us rave reviews on the effectiveness of this procedure and we are happy to offer it as another way to effectively and safely manage pain in our patients. To discuss the benefits of laser therapy, call us today - 231-652-1681.